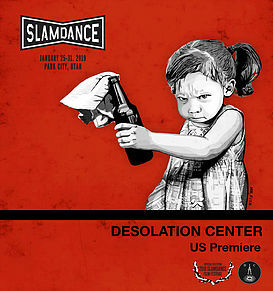 There’s a Cleveland connection at this year’s Slamdance Film Festival with the U.S. premiere of the documentary film Desolation Center. This documentary is the untold story of Reagan-era guerrilla punk rock desert happenings that are now recognized as inspirations for Burning Man, Lollapalooza and Coachella. Directed by the events’ organizer, Desolation Center is the true story of how the risky, and even reckless, actions of a few outsiders can lead to seismic cultural shifts. Long-time GCFC supporter, and former Cleveland crew member, Carol Maple Oppenheim is credited (Carol Maple) as an Associate Producer on the documentary. Over the past couple of years, she has been involved with the film as an early supporter, providing both financial and hands-on help. Her son Jackson worked on the film as a PA, and is credited with Additional Camera. In 1983, Carol was one of the 115 attendees at Mojave Exodus, the first Desolation Center desert event. Another Clevelander, Production Sound Mixer Kip Gynn, provided archival photos used in the film and is credited with Still Photography. Kip and Carol both attended the 1983 event together, and some photos of them made it into the film! The filmmakers hope to have a Cleveland screening of the film in the future, so stay tuned! Read more about the birth of the modern desert music festivals in the New York Times Article: Hundreds of Punks Hit the Desert. The Modern Music Festival Culture was Born.